Objectives The aim was to assess the association between occupational biomechanical exposure and the occurrence of radial nerve entrapment (RNE) in construction workers over a 13-year follow-up period. Methods A cohort of 229 707 male construction workers who participated in a national occupational health surveillance programme (1971–1993) was examined prospectively (2001–2013) for RNE. Height, weight, age, smoking status and job title (construction trade) were obtained on health examination. RNE case status was defined by surgical release of RNE, with data from the Swedish national registry for out-patient surgery records. A job exposure matrix was developed, and biomechanical exposure estimates were assigned according to job title. Highly correlated exposures were summed into biomechanical exposure scores. Negative binomial models were used to estimate the relative risks (RR) (incidence rate ratios) of RNE surgical release for the biomechanical factors and exposure sum scores. Predicted incidence was assessed for each exposure score modelled as a continuous variable to assess exposure–response relationships. Results The total incidence rate of surgically treated RNE over the 13-year observation period was 3.53 cases per 100 000 person-years. There were 92 cases with occupational information. Increased risk for RNE was seen in workers with elevated hand-grip forces (RR=1.79, 95% CI 0.97 to 3.28) and exposure to hand-arm vibration (RR=1.47, 95% CI 1.08 to 2.00). Conclusions Occupational exposure to forceful handgrip work and vibration increased the risk for surgical treatment of RNE. Occupational biomechanical exposures such as repetitive movements, vibration and elevated grip force may increase the risk for radial nerve entrapment (RNE). Workers with elevated hand-grip forces and with exposure to hand-arm vibration were at higher risk of surgery for RNE. Workers exposed to repetitive elbow and wrist flexion and extension showed a modest association with risk of surgery for RNE. Decreased exposure to occupational biomechanical risk factors may be important for primary prevention as well as secondary and tertiary prevention for persons with RNE. RTS has been described in different occupational groups including industrial textile workers,4 television, shoe and automobile manufacturing workers,5 brick layers, fitters, machine operators and telephonists.8 One case–control study examined biomechanical exposures and identified repetitive grip force work (OR 9.1, 95% CI 1.4 to 56.9), prolonged static hand loading (OR 5.9, 95% CI 1.2 to 29.9) and working with fully extended elbows (OR 4.9, 95% CI 1.0 to 25.0) as occupational risk factors for RTS.5 The study was based on 21 cases and 21 controls (17 women and 4 men) and thus had low power leading to low precision in risk estimate. Occupational exposures were assigned based on expert opinions on the job held 6 months prior to diagnosis but did not consider the influence of a longer exposure history. Diagnosis of RNE can be difficult and is often controversial. The use of strict inclusion criteria can limit the risk of misclassified cases, including cases of epicondylitis.5 Patients with RNE who do not respond to rest, anti-inflammatory medication or physiotherapy exercises are candidates for surgical decompression of the radial nerve, distal to the elbow3 and thus the use of a surgical case definition for RNE could decrease misclassification. The aim of the current study was therefore to assess the association between historical information on biomechanical exposure and the occurrence of decompression surgery for RNE in a large construction worker cohort over a 13-year follow-up period. A large sample of male construction workers was followed prospectively for 13 years to identify the surgical treatment of RNE and its association with prior occupational, physical exposures. The study cohort was selected from a total of 389 132 Swedish construction workers who participated in health examinations as part of a national health surveillance programme (‘Bygghälsan’) conducted from the late 1960s until 1993. While participation was voluntary, at least 80% of eligible workers completed at least one health examination.9 Worker height, weight, age, smoking status and specific trade (‘job title’) data were recorded on examination. The Swedish national registry of outpatient surgical records was searched to determine cases, defined by surgical release of RNE (Swedish code ACC52). For this study, computerised data were available from the start of the register in 2001 until the end of 2013. Register linkage was achieved using the unique personal number assigned to each Swedish resident. Vibration-exposed workers were also likely handgrip exposed as the use of a vibrating hand tool requires grip force; however, these scores were kept separate because they may involve different pathological mechanisms. Self-reported smoking status was extracted from the same health examination that provided job title, and workers were classified into never, ever and unknown categories. Height and weight were taken from the first health examination; workers were classified into normal (body mass index [BMI] <25 kg/m2) and overweight (BMI ≥25 kg/m2) groups. In this study, we limited our analysis to men since women comprised only 5% of the population and most belonged to the ‘other’ occupational group for whom no physical exposure estimates could be made. Workers were also excluded who: were younger than 16 at their first health examination; were unusually short (<150 cm) or tall (>200 cm); or had died, emigrated, retired or had a record of RNE release surgery prior to the start of the observation period in 2001. In addition, workers for whom no job title was recorded in any of the medical examinations or who were classified in the non-specific other work group were removed as they could not be mapped onto the JEM. The remaining 229 707 workers comprised the study cohort (figure 1). Flow diagram outlining exclusions from construction worker cohort. A single worker may have met more than one criterion within each of the exclusion boxes. JEM, job exposure matrix; RNE, radial nerve entrapment. For the study cohort (92 cases), negative binomial models with a log link were used to estimate relative risks (RR) (incidence rate ratios) and 95% confidence intervals for the biomechanical factors and biomechanical exposure sum scores as categorical variables, adjusted for age, BMI, smoking status and surgical time (first or second half of the observation period). In all models, the lowest factor or exposure score rating was used as the reference category. The same regression function was used with splining to model incidence for each exposure score as a continuous variable over the range of available values (ranges given for each in equations (1)–(4)) and assess exposure–response relationships. In order to separate the influence of grip force from hand–arm vibration, a sensitivity analysis was conducted on the association between grip force and RNE decompression surgery only in workers who were not deemed exposed to HAV. A total of 99 RNE surgical cases were identified during the observation period, of which 92 cases could be mapped to the 21 occupational groups included in the JEM. The 99 cases represented an incidence rate (IR) of 3.53 cases per 100 000 person-years. The rate was higher during the first half of the observation period (2001–2006) compared with the second half (2007–2013; 5.03 vs 3.03 per 100 000 person-years). The concurrent (2007–2013) incidence rate of RNE decompression surgery for men of a similar age range (25–74 years) in the general Swedish population was 2.29 per 100 000 person-years (95% CI 2.09 to 2.51). Thus, the incidence rate in the construction cohort during the second half of the observation period was approximately 30% higher than the national background rate. The study cohort (n=92) accrued 2 899 329 person-years of observation. RNE surgery risk increased with age up until 54 years and then decreased (table 2). No strong association was found between BMI or smoking status and risk of RNE surgery. Biomechanical factors related to upper extremity loading, elbow posture, vibration, and repetitive and static work were associated with RNE surgical treatment (see the online supplementary table 3). An exposure–response relationship was suggested for grip force, upper extremity load, frequency of repeptitive elbow flexion and extension, frequency of repetitive wrist flexion and extension, frequency of hand-held tool use, and exposure to hand-arm vibration. Biomechanical exposure scores comprising correlated factors showed workers with elevated scores for grip (RR=1.79) and vibration (RR=1.47) showed the highest risk of RNE surgery (table 3). Workers with exposure to repetitive flexion and extension and static work and elbow leaning had a moderately increased RR for RNE surgery (1.3-fold to 1.4-fold). 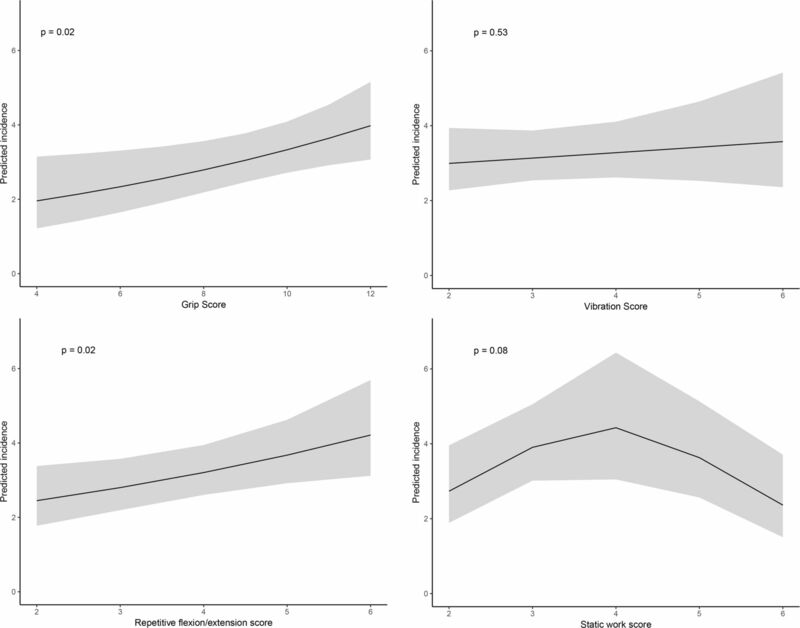 In the models with continuous exposure scores, both grip (p=0.02) and repetitive flexion and extension (p=0.02) were positively associated with RNE surgery incidence (figure 2). No exposure–response relationship was observed for the vibration or static work and elbow leaning scores. Predicted incidence for onset of RNE decompression surgery by exposure score level modelled as a continuous variable for grip score (unexposed score=4), vibration score (unexposed score=2), repetitive flexion and extension (unexposed score=2) and static work (unexposed score=2). 95% CI shown in grey. RNE, radial nerve entrapment. The sensitivity analysis showed that the RR for exposure to elevated grip force did not differ between workers exposed and unexposed to vibration. Of the 229 707 workers in the study cohort, 150 467 participated in at least two health examinations. Of those, 23% who first reported job titles that mapped to our 21 occupational groups reported a job title on their last health examination that mapped to a different occupational group or the ‘other’ group. The average time between health examinations was 9.5 years (range: 7.6–11.2 years across occupational groups). 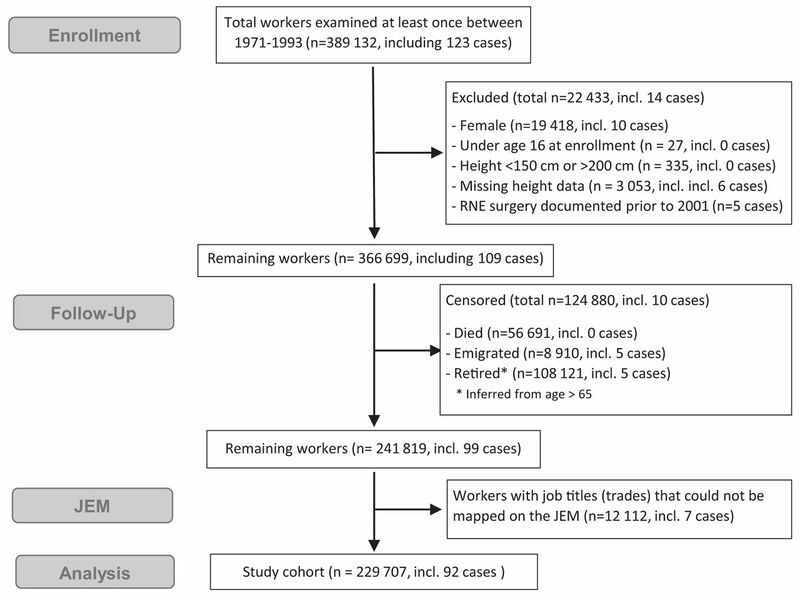 This large cohort of construction workers had an incidence of 3.53 cases per 100 000 person-years (95% CI 2.88 to 4.28) of surgical release for RNE during the period 2001–2013. Surgical treatment for RNE was associated with work exposure to the biomechanical factors upper extremity load, forceful hand-grip work, vibration, and repetitive elbow and wrist flexion and extension, with RRs ranging from 1.5 to 1.9. The biomechanical exposure scoresmost strongly associated with increased risk for RNE surgery were grip and vibration. Although RNE decompression surgery was a rare event in this cohort, given the prevalence of exposure to high grip force (46%) and the estimated RR of 1.96, approximately 30% of all cases in the study cohort can be attributed to high grip force exposure at work. In this study, we used a cohort-specific JEM based on detailed descriptions of biomechanical exposures and activities comprising each job title. This is often considered the best available method for retrospective exposure assessment in cohort studies.12 In the original evaluations, job descriptions were recorded by ergonomists working in the construction industry who observed workers performing each job during regular site visits between 1970 and 1975. The reports also contained crude estimates of awkward postures and forceful loads, but in a way that was insufficient to facilitate the comparison of specific biomechanical factors that have since been identified as aetiologically relevant for nerve entrapments such as carpal tunnel syndrome and ulnar and RNE symptoms. Hence, our cohort-specific JEM was created by two raters who re-evaluated the historical sources with current insight into relevant exposure parameters. Biomechanical factors that were not documented in the original ergonomic reports but that have since been deemed aetiologically relevant, for example, supination,5 were not evaluated in this study. Many of the biomechanical factors in the JEM were highly correlated, and thus it was difficult to isolate the influence of each specific factor on surgically treated RNE. Exposure sum scores of highly correlated factors were therefore used in the final stage of the model. Some factors, such as hand-arm vibration and grip force, are intrinsically linked and thus their unique contributions cannot be elucidated. The results presented must be viewed as proxies for complex exposure patterns and should not be interpreted as specific exposure–response associations. Further, the study lacks specificity for cumulative exposure level, in absolute terms, or latency period relevant to surgically treated RNE. The Swedish surgical code used in this study (ACC52) includes decompression surgeries of the radial nerve at all sites in the upper extremity, and not only decompression surgeries distal to the elbow. While decompression surgery is most commonly performed distal to the elbow, some of our cases may include surgeries performed at other locations. Further, decompression surgeries proximal to the elbow can be performed to alleviate both posterior interosseous nerve syndrome (PINS) and radial tunnel syndrome (RTS). While we believe many of the cases in this study were indeed patients with RTS, the diagnosis data in our database are insufficient to quantify this supposition, and thus, the associations shown in the study must be considered at the broader level of ‘risk for RNE decompression surgery’ rather than for one specific underlying diagnosis, namely, RTS. Three previously identified biomechanical risk factors in an RTS case–control study5 were corroborated in the present study. The finding of forceful handgrip work as a risk factor for RNE is compatible with a pooled analysis of six prospective CTS incidence studies13 that identified forceful hand exertions and forceful repetitions as relevant biomechanical exposures. Forceful handgrip work was recently identified as a risk factor for ulnar nerve entrapment in the same Swedish construction cohort.10 Pressure on the nerve14 has been proposed as the biomechanical mechanism linking high grip force to neuropathy symptoms, such as those experienced in RTS and other compression syndromes. This study is the largest prospective cohort study to date to assess occupational risk factors for RNE. We were able to identify incident RNE cases and provided ample statistical power while maintaining a strict case definition of physician diagnosis and surgical treatment. The case definition was important given the relative ease of diagnostic confusion between RTS and epicondylitis.15 All construction workers within the cohort had good access to occupational healthcare and general medical healthcare, which is nearly free of charge in Sweden. Admission standards may have varied slightly across the country, and construction workers in this nationwide study lived, worked and were treated locally; however, we do not expect that the likelihood of admission would be related to any of the individual or biomechanical exposure variables. Smoking and obesity are associated with socioeconomic status; we controlled for these factors in our analyses even in the absence of significant associations with RNE. Last, the consistency of the findings between the categorical and continuous treatment of the exposure scores demonstrates that the results do not rest heavily on the modelling approach chosen. In this study, occupational biomechanical exposures were determined at the group level, which does not account for individual work strategies or specific job assignments. Further, we did not adjust for potential changes in the occupational group between the health examination at which the job title was recorded until RNE surgery, censoring due to death or immigration, or the end of the observation period. In Sweden, a large proportion of those employed in the construction industry are skilled workers who have rather high-income levels compared with other Swedish blue-collar jobs. Accordingly, workers tend to stay in their trade in the construction industry. While it is likely that some workers changed jobs, and also that the jobs themselves would have changed over time due to different work methods and advancing technologies; this was not reflected in the JEM scores. Finally, individuals who were sensitive to RNE may have changed jobs earlier in their careers, resulting in an over-representation of non-sensitive persons among the highly exposed jobs given the wide range of ages at first examination (16–65 years). This healthy survivor effect would also tend towards an attenuated estimate of the risk. The incidence rate for RNE decompression surgery for the construction worker cohort was approximately 30%–40% higher than the incidence rate for all Swedish men of the same ages. This further suggests that even the ‘low exposed’ workers were at elevated risk, compared with their counterparts in jobs outside of the construction sector. If the available dataset had included a truly unexposed reference group, with no history of strenuous manual work, the estimated risk ratios might have been even higher. Case ascertainment based on surgical treatment can be viewed as both a strength and weakness of the study. The strict criteria were used to avoid misclassification between RTS and epicondylitis, but they may also have resulted in some underestimation of the proportion of workers affected by RNE. Finally, the high grip force requirements present in many construction occupations may have led to a higher incidence of surgical treatment, while workers exposed to lower physical demands may have been more likely to pursue non-surgical treatments. This large-scale prospective study indicates that biomechanical exposure to forceful handgrip work, vibration, and repetitive elbow and wrist flexion and extension are risk factors for radial nerve decompression surgery. The authors thank Hans Petterson for his work in developing the vibration JEM and help in translating job titles, and Per Liv for his assistance with statistical analyses. The Swedish Research Council for Health, Working Life and Welfare supported this study (grant 2016-01016).
. Radial tunnel syndrome: resistant tennis elbow as a nerve entrapment. J Bone Joint Surg Br 1972;54:499–508.
. Peripheral nerve entrapment and injury in the upper extremity. Am Fam Physician 2010;81:147–55. Contributors JJ: worked on study design, data analysis, manuscript preparation, revision and submission. DO: worked on data extraction and analysis. AB: worked on study design, and manuscript preparation and revision. LP and JW: worked on study design and manuscript revision. BJ: worked on study design, data analysis and manuscript revision. Funding This study was funded by Forskningsrådet om Hälsa, Arbetsliv och Välfärd (FORTE 2016-01016). Ethics approval The study was approved by the Regional Ethical Review Board in Umeå (2017/16-31).